I’ve found a healthy breakfast that keeps me full until lunchtime. Now that’s an achievement! I’m constantly eating and since I was pregnant with twins, I can’t leave home even now without a container of nuts, an apple or a date bar in my handbag (actually normally its all 3!). I worked with a good friend once in a hotel banqueting team who introduced me to the concept of ‘elevenses‘. This would normally involved a cup of tea and something sweet to get us through until a late lunch break … timing it just right so that the client lunch buffet had just been cleared and we could eat the leftover client food rather than the staff canteen food! Working in a hotel there was never a shortage of sweet treats to go with a cuppa and my ever expanding waistline showed it. After making Almond Pancakes the other morning, I was pleased to notice I skipped my usual constant all day snacking, made it right over elevenses and was good until lunch without even thinking about food. 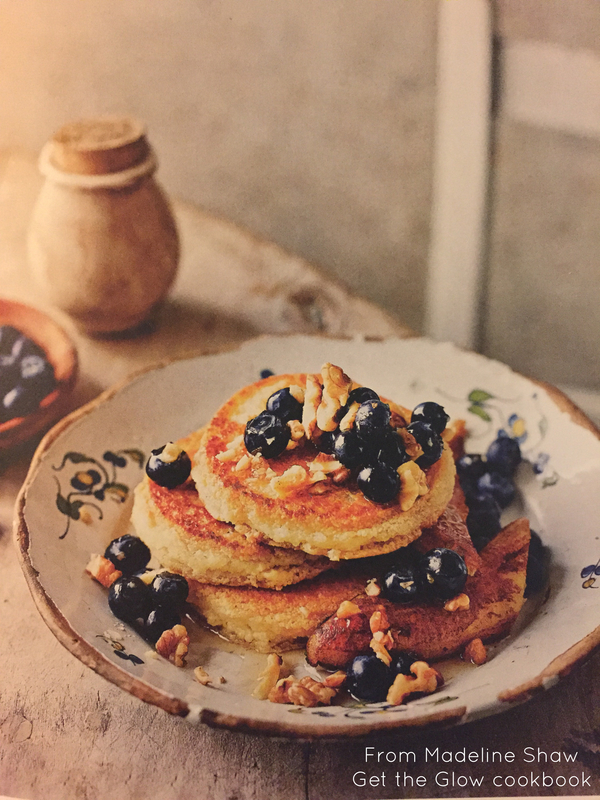 These pancakes could even be a post-workout treat! I love pancakes as a weekend breakfast and it has become a special time of us all in the kitchen pitching in and making a weekend breakfast spread worthy of white linen and a silver butter knife. These pancakes are super easy, they can be mixed in only one bowl to keep washing up to a minimum and should be made ahead of time. This makes getting breakfast on the table super quick in the morning, so much so this has even turned into a mid week breakfast option for us! Add the almonds, salt and baking powder to a bowl. Stir to combine then add the vanilla, eggs and milk. Stir together vigorously and leave to sit in the fridge for at least 20 mins, and up to 12 hours. [Hint: This is the step you want to do the night before to make it super quick in the morning!]. If you have a NutriBullet – this recipe fits in the large cup. Add the wet ingredients first, then the dry and wizz it up. This makes the almond flour finer and less crumbly in the finished pancake. Remove the pancake batter from the fridge and heat the coconut oil in a frying pan or griddle over medium heat. Pour about 60ml of batter into the pan to make pancakes. Cook until bronzed underneath (around 3 mins), then flip and cook on the other side for another few minutes. Repeat with the rest of the batter. Stack them and keep them warm. Slice the bananas in large thick diagonal slices. In a separate pan, heat 1 tablespoon of butter/coconut oil over medium heat for 1 minute. Place the banana pieces in the pan and cook for 2 mins on one side until they start to brown. Turn them over, drizzle with honey, sprinkle with cinnamon and continue cooking until browned on the other side and the butter/honey/cinnamon makes a sticky sauce. From our breakfast kitchen to yours.